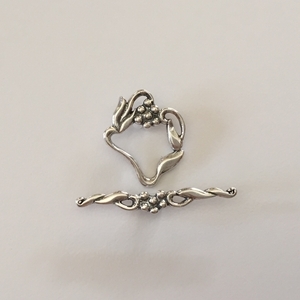 Sterling Silver Toggle Set. A fun and fancy square of leaves and a cluster of balls or grapes. The attaching rings are on the underside of the ball clusters on both the square and the bar. Square measures approximately 18 x 15mm, and bar measures approximately 31mm. Sold per set (one toggle (square) & one bar.